Space garage maestro Billy Syndrome returns with a collection of songs that includes new recordings, songs that have been waiting for release, and some that were recorded during JFK Jr Royal Airforce sessions. The CD opens with "Clang! ", on which we hear Billy going on what sounds like a religious rant backed by Louis Boones' keyboards. "Manic D" is a countrified cover of Jimi Hendrix's "Manic Depression", done in Billy's inimitable garage style. "Rubulad" is a bouncy party tune that pays tribute to the studio where Slutfish recordings are done and was recently evicted. "What Do You Want From Me Baby?" is a doomy metallic space garage dirge that is actually a love song about a relationship gone bad. "Ugly Like Me" has a similarly heavy thudding but tripped out feel. "Disappear" is a solid raw punky rocker with a 60's garage feel. "Eternal Prison" is another heavy rocker embellished by all sorts of fun whistle and such sounds. "Pledging My Love" is an anti-folk cover of a 50's song with a very cool jamming freakout bit at the end. And "Pumpkin At Eleven" is an upbeat rock song that crosses a 60's Byrds flavor with an angrier garage sensibility. The highlight of the album is the 15 minute "Experiments In Fear", a rant against religion and brainwashing backed by collaged electronics and sounds. A repetitive thudding bass and Casio beats keep the pace throughout, while a parade of freaky sounds, totally spaced synths, trumpets, and screaming voices march through. We also get a bonus track recorded in 1988, "The Power Of Love", that was written for Michael Jackson. You want funk? This is it baby! 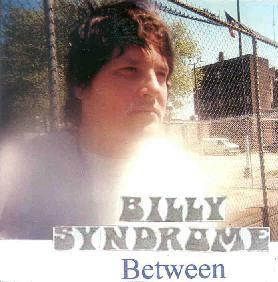 In summary, Billy Syndrome is probably my favorite purveyor of garage rock, and as a huge fan of space rock and psychedelia, with equal parts anger and humor, Billy offers more variety and fun than many of his contemporaries. Hell, he's been doing it for over 20 years now. If you haven't jumped on the Syndrome bandwagon yet, and like your rock seriously RAW, then check out this or any one of several available releases from Billy and his space rock band The JFK Jr Royal Airforce. For more information you can visit the Slutfish Records web site at: http://www.slutfishrecords.com/. Contact via snail mail c/o Slutfish Worldwide; 327 Bedford Ave #A2; Brooklyn, NY 11211.